EU commissioner Laszlo Andor has been under fire since he claimed last week that welfare tourism is “neither widespread nor systematic.” However, the newly published International Handbook on the Economics of Migration, co-edited by Amelie F. Constant and Klaus F. Zimmermann from IZA, confirms Andor’s position. Anti-immigration sentiment is on the rise in Europe. The UK has recently joined Germany and several other EU member states in projecting a rather reserved position when it comes to access of immigrants to their labor markets and welfare systems. Reviewing the state of the art in economic research, the handbook chapter on welfare migration concludes that “fears about immigrant abuse of welfare systems are unfounded or at least exaggerated.” Robust evidence shows that even if some relationship between immigration and welfare generosity is found, it is rather exiguous. “In fact, recent research suggests that immigration may lead to increased welfare generosity,” explains Corrado Giulietti, one of the contributing authors. According to a research paper by an IZA team that came out in International Journal of Manpower earlier this year, the economic situation or presence of relatives or other contacts in receiving countries are some of the much more important pull factors. The main goal of migrants from new member states coming to the old EU states is employment, according to the Handbook. Immigrants have been scapegoated, and not only by rising anti-immigrant parties in countries such as France or the Netherlands, also for their alleged abuse of social benefits. An earlier study by IZA and the Economic and Social Research Institute (ESRI, Dublin) shows that in most EU member states immigrants are in fact less likely to use the welfare system than natives. “Analysis of hard data reveals that even for unemployment benefits immigrants are equally and in several countries less likely recipients than comparable natives,” asserts Martin Kahanec, co-author of the study. “We need a paradigm shift, from the debate about abuse to a debate about lack of access to social benefits and services,” he adds. Aging and crisis-stricken Europe needs to tap on all available resources. Mobile workers can provide the much-needed flexibility and skills where they are needed. “The role of migration is ever more, and not less, important in times of economic crisis. Mobility can not only absorb some of the negative shocks, but also contribute to recovery through increased efficiency,” concludes IZA Director Klaus F. Zimmermann. 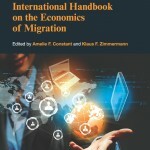 For more information on the International Handbook of the Economics of Migration, see the Handbook’s homepage and a video of the Handbook’s Presentation with statements of the editors.